How can we achieve a higher standard of living? One way might simply be to work more, trading some free time for more income. Although working more will increase how much we can produce and purchase, are we better off? Not necessarily. Only if we increase our efficiency—by producing more goods and services without increasing the number of hours we work—can we be sure to increase our standard of living. That’s why BLS produces labor productivity statistics every quarter that tell us how well we are improving our economic efficiency. These measures compare the amount of goods and services we produce with the number of hours we work. How can we can improve labor productivity? There are many ways. We can use more and newer machinery and equipment. We can develop new technologies that streamline production. We can improve organization and communication in the workplace and manage people more effectively. Or, we can increase worker skills through education or job training. 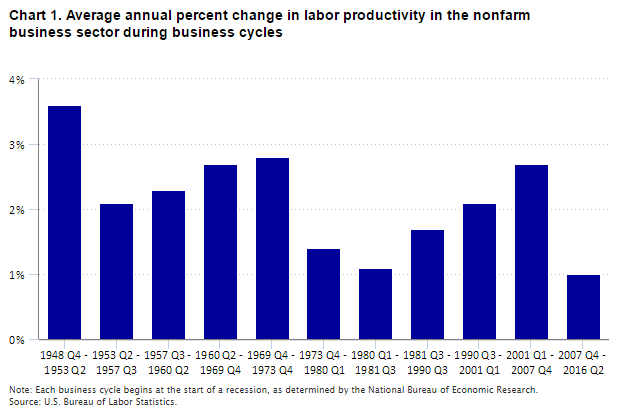 So, how much has U.S. labor productivity improved over the years? Compared to 1947, we now produce 330 percent more goods and services per hour of work. On average, thanks to advances in technology, education, management, and so on, you can do in 15 minutes what your grandparents or great grandparents needed more than an hour to do in 1947. This is a substantial increase, and we can see it in the many improvements in living standards since World War II. Productivity growth in recent years hasn’t been as strong, however. It may seem surprising, given all the new technologies and products in recent years, but we are now living through one of the lowest productivity-growth periods ever recorded. Since the Great Recession of 2007–09 began in the fourth quarter of 2007, labor productivity has grown just 1.0 percent per year. That is less than half the long-term average rate of 2.2 percent since 1947. Although the U.S. economy has been experiencing slow productivity growth since 2007, some industries have been doing well. For instance, the wireless telecommunication carrier industry has had annual labor productivity growth of over 15.0 percent since the beginning of the Great Recession. Labor productivity growth in the nonfarm business sector is lower in the current business cycle than during any of the previous ten business cycles. Chart 1 shows average annual labor productivity growth during business cycles since World War II. Multifactor productivity—which accounts for the use of machinery, equipment, and other capital, in addition to labor—has also increased more slowly over the current business cycle; it has grown 0.4 percent per year during the 2007–15 period, compared to its long-term rate of 0.9 percent per year since 1987. Historically, productivity growth has led to gains in compensation for workers, greater profits for firms, and more tax revenue for governments. Compensation, which includes pay and benefits, has not always risen as fast as productivity, however. (See chart 2.) The difference between labor productivity gains and real hourly compensation growth is often called the “wage gap.” Real hourly compensation growth tracked labor productivity growth more closely before the 1970s. 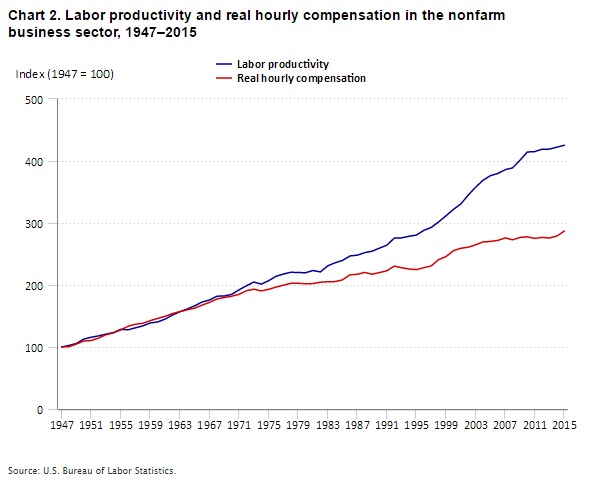 Since then, growth in real hourly compensation has lagged behind gains in productivity, widening the gap considerably. Since the start of the Great Recession in the fourth quarter of 2007, real hourly compensation has grown by only 0.6 percent per year; that’s less than half the long-term average of 1.6 percent per year. You can stay up to date on productivity trends and other economic news by signing up for our email alerts or following us on Twitter.